On October 20, Malmö New Stadium hosted a press conference by the head coach of Malmo dedicated to the upcoming match against Donetsk. - Felipe Carvalho missed the last training session. Will he play tomorrow? - No, he won’t. He has a problem with his knee. We still have more games ahead, so we won’t risk the player, until he is back to his optimum form. - Shakhtar often play in European competitions. What can you say about the strengths and weaknesses of this team? - We have seen Shakhtar, we know what the team is like. They really played neck and neck against Real Madrid. But they were a bit unlucky in terms of the awarded penalties and conceded goals. We have also seen their last match against Dynamo. Shakhtar produced a top-level perfromance, with high speeds. In general, the match was of a global scale. The Brazilians of Shakhtar showcase excellent technique. The defence represented by players from different countries, also operates efficiently. Shakhtar are better, faster than Olympiacos, who came to us last year. But we are also getting ready to fight them back decently. - Do you believe it will be easier for you mentally than against Real Madrid or PSG? - Of course, as the players experience different feelings in the encounters with Real Madrid or PSG. Nevertheless, we properly set up for every meeting. We've seen one and the same team, for example, Juventus or Atletico, act differently depending on whether it's the final or a meeting at an early stage. But we know what qualities of ours to focus on. I think we're ready for the Champions League game, being ready to show the topmost level. - So your players are just on the starting blocks? - Well, not to that extent. They are still young, many of them are 20 to 21. When at that age they meet with Ibrahimovic or Ronaldo, of course they may well have their knees trembling. We are all still learning, but I think no one trembles before the upcoming game. - Taison will not take part in the match. When Metalist played here, he grabbed a brace. What will his absence mean? - We know that he is a good player who always shows some top-level football. Taison is very fast, so it is difficult to defend against him. We had some hard time in the game against Metalist. We also remember Chelsea player Willian, who used to play for Shakhtar. In principle, one player does not have a decisive influence on the course of the match. Shakhtar have many worthy substitution players. Therefore, the presence or absence of some of them does not change the overall picture. - Usually, your team play with two strikers deployed. Don’t you consider this manner as being too risky in the match vs Shakhtar? Perhaps we should expect to see the fifth defender? - We often use the 3-5-2 formation, this year even more frequently than in the past one. We also deployed the 4-4-2 one, but those are two different arrangements. We presume what formation will be better against a particular opponent. We have made changes only when playing against Salzburg, while generally, we adhere to our basic formation. - Who of the Donetsk club players do you fear the most? - We base it on the statistics, we see the number of attempts on target: 50-60, which can be scored. Shakhtar have a strong striker and the powerful attacking third – the defenders attack together with the forward. The opponents have many skilled performers. So let's see. We are ready to counteract Shakhtar through our strong defensive line, we have been working on it very hard in order to protect our borders from the attacks by Donetsk. I know that the Pitmen are very fast, they have a well-organised passing game, but we will defend from their deliveries into the penalty area. In general, we are ready to meet Shakhtar fully prepared. - How much different will be the game from the matches against PSG and Real Madrid? - In the encounters with PSG and Real Madrid, everything was centered around Ibrahimović or Ronaldo. And Shakhtar must be focused on as a team. The press, for example, always mentions Ronaldo when it comes to Real Madrid. Of course, it never affects Markus Rosenberg psychologically, but the young players find it more difficult to encounter those names. But I think that this season we are looking better than in the past one. Our guys are showing their best qualities when playing aggressively, fast and when they play boldly, just like in the match against Real Madrid. We are committed to ensuring that we have more control of the ball, though, of course, we happen to make mistakes. It's a shame to stumble once and concede one because of that immediately. As for PSG, they have Ibrahimovic - a very strong footballer. Nevertheless, we were ready to oppose him and the whole team of Paris. 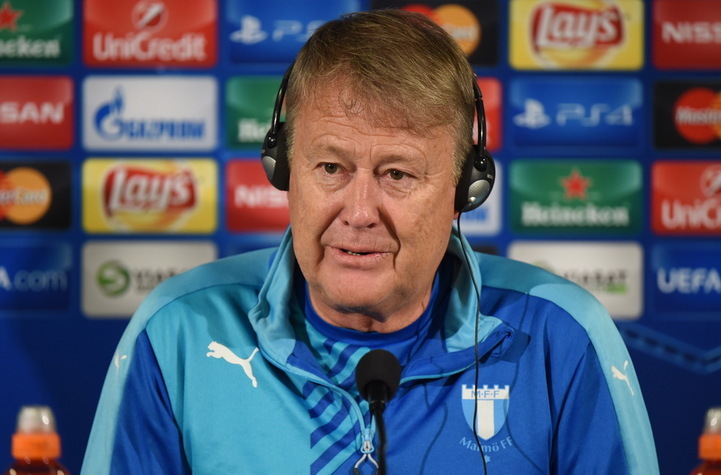 - After two matches Malmo have zero goals and zero points. How would you comment on that? What can you say about Mircea Lucescu, whose upcoming encounter is the 100th in the Champions League group stage? - Shakhtar have the same performance indicators in this competition as we do - there is no difference. I know that the coach of our opponents is a strong and sensible expert, he has great international experience, he has created a team who represent Ukraine in the Champions League. - Of course, they will try to patch up holes in their defence. In any case, they act boldly, practising some very interesting and compact football. For example, if we are 1-0 up and try to keep the score, there can be no guarantees as for our points, because the opponents make very quick transitions from defence to attack. Someone thinks this style of play is naive, but won’t agree with that. We can benefit from the counter-attacks - this is our chance. When Shakhtar leave their box, we can catch them. Yes, they concede goals and do not convert their chances – we will try to punish them for such errors if they make any. But I do not think that their star has faded.